In SharePoint Online, I am trying to see if there is a way to update managed metdata term set term values from values stored in an excel file. Basically client would like to automate this process by scheduling a powershell script via a task scheduler so they don't have to manually add the new term values. I have a term set setup called "Programs" as shown in the below screenshot. 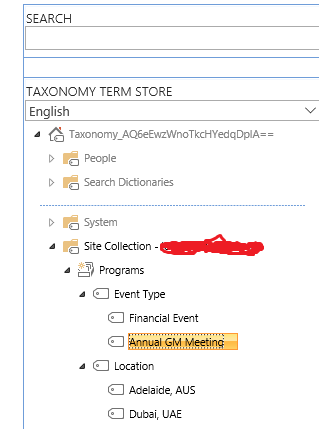 So now the requirement is to have An excel file stored in OneDrive which will usually be updated on weekly basis with more terms being added relevant to Event Type and Location terms. 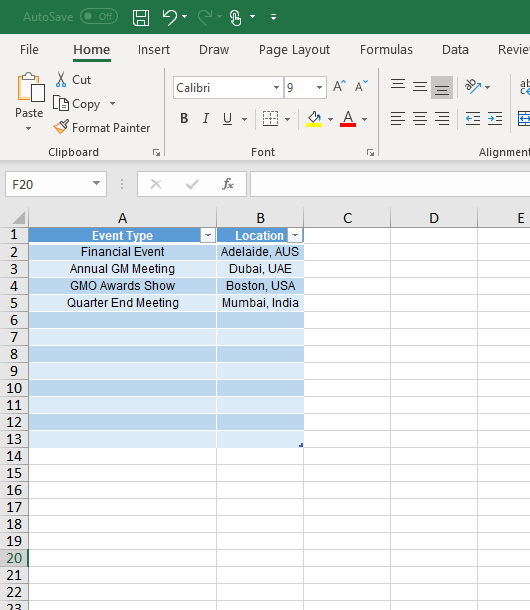 Please see below excel file screenshot that can be stored in excel located in OneDrive or any other place to make this to work, open to suggestions. As you can see, I have Event Type and Location setup as column headers. So is it possible to update term specific values in term store by leveraging values added in excel file. Also I would like to make sure that there is no duplication be done in regards to term values. If someone knows what can be done here, please help with a solution. Thanks in advance. FYI, open to any suggestions as long as the solution would work in SPOnline. You could import the terms from excel using PowerShell in SharePoint online. Then you could schedule to run the PowerShell from the task scheduler. SharePoint Online: Import Terms to Term Set from CSV using PowerShell. How to Run a SharePoint PowerShell Script From Task Scheduler. Not the answer you're looking for? Browse other questions tagged sharepoint-online powershell term-store or ask your own question.